Kentucky Scott #1, 1985 $5.25 Mallards. NH XF. Artist Ray Harm. 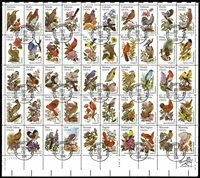 First duck stamp of state. 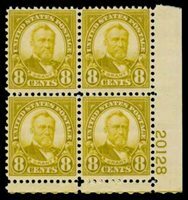 Scott #640, 1927 8c Olive Green Grant Plate Block of 4. NH VF. Rich color. 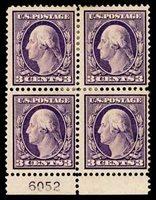 Scott #376, 1911 3c Violet Washington Block of 4 with Plate Number 6052. Mint F-VF. Hinged. Some perf separations. 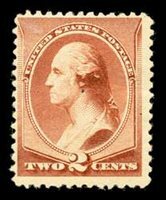 (Scott 2009 $90). 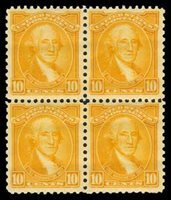 Scott #715, 1932 10c Orange Yellow Washington Bicentennial block of 4. NH VF. Brilliant color. Key value of the set! 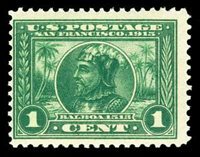 (Scott 2011 $60). 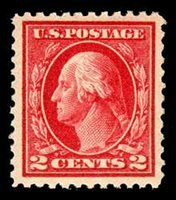 Scott #499, 1917 2c Rose Washington. NH Superb. Balanced boardwalk margins. This has to be one of the choicest examples you could ever find! SMQ XF-Superb $90, Superb $225. Scott #R5c, 2c blue Bank Check. Used F-VF.